The AP World exam just transpired and I am in full reflection mode. I asked my students a few questions about things they felt they needed based on the test they just took. The students felt they needed more writing practice throughout the year. They felt they needed more individual practice with feedback on their ability to perform on the spot. To give some context on the test, the exam has four components. 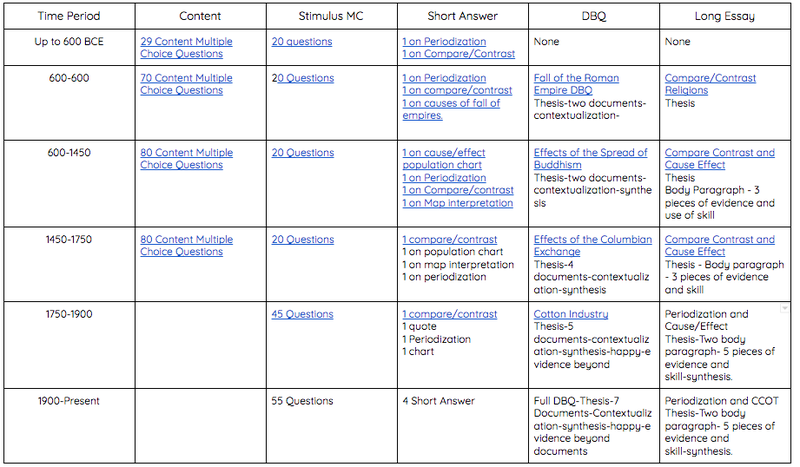 Part one is fifty-five stimulus multiple choice questions. Part two is four short responses. Part three is one document based question (DBQ). Part four is one long essay exam. While AP does give a course framework, the students do not know the prompts or documents ahead of time. To adequeately gather enough assessment data for each component, it takes a lot of class time. To prepare the students for each component and give feedback along the way so students feel success, it takes a lot of class time. Despite the enormous use of classtime, I feel they are one of the best elements of the class because they require the students to think. Since they take a lot of class time, I have often taught small elements of the essays in the first few units, but never had hard checkpoints or summative assessments for each writing component in each unit. Based off the student feedback and my feelings on the year, I created an assessment chart to ensure a linear progression of the skills required for each component of the exam. I wanted to hold myself accountable to formally assessing each part in each unit with the exception of the first unit which is a very short unit. I did not want to assess the entire essay in the beginning because it would be too difficult and too time consuming. To give an example of the progression, in the second unit, I will give the students a two document DBQ. The students will only be required to write a thesis, give contextualization, and connect the two documents to their argument. This will not require fifty-five minutes like it will at the end of the year. It only assess three skills, which I can easily provide feedback to the students to help them grow by the next assessment. Each unit I add a skill or documents to progress them towards the final product of seven documents. Unit three adds the synthesis skill. Unit four moves to four documents. Unit five adds source component and five documents. Furthermore, it gives me data on what my students have mastered and need help on at a very early stage in the year. They do not need to be able to write a DBQ until the middle of May. I have selected the DBQ's for each unit already and tailored the documents to get at the skills being assessed. I am hoping that this holds me accountable to ensuring that students are progressing in the skills to be successful. Furthermore, my hope is that the students will master the skill in smaller doses so I can make them feel comfortable with the exam, hold them to a higher writing standard in the end, and not spend as much class time in the last few weeks leading up the examination.